FORT LEONARD WOOD, Mo. (April 11, 2019) – The U.S. Army Chemical, Biological, Radiological and Nuclear School held a ribbon cutting ceremony Monday marking the official end to a six-month redesign of Fort Leonard Wood’s Chemical Defense Training Facility. 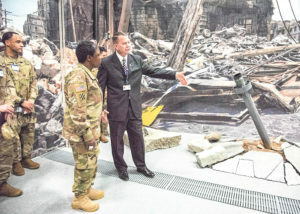 The more than $6 million Training Enhancement Initiative, the name given to the redesign, has taken the facility from a live-agent training facility in a sterile environment with concrete walls and no connection to realism, to areas using real-life scenarios, from the past and present, and from around the world. Now, “training at the CDTF is all reality-based,” CDTF Director Daniel Murray said. Scenes are visually authentic and supplemented with custom audio and lighting effects, according to Murray. Murray said authentic and interactive training aids are also being used to further create a more realistic environment in the already one-of-a-kind facility within the DoD where live-agent training can take place. The facility, specially designed for containment of toxic material, is now set up with 11 separate training, or “target” areas all accessible from one large common area which is a scenario in itself. Most targets are set up in individually-themed rooms ranging in size between 900 and 2,000 square feet. According to Murray, 16 new lesson plans have been created to cover the new scenarios and target areas. The 11 target areas include an urban industrial area; dismounted unit defense vs. enemy counter-attack/chemical attack; division rear area logistics base — post chemical attack; enemy weapons cache with leaking munitions; dense urban ruins — post chemical rocket attack; clandestine weapons of mass destruction manufacture; commercial shipping facility engaged in proliferation of WMD; state-level WMD production/weaponization facility; state-level WMD storage facility (munitions, bulk agent); urban subway stop/platform — attack on mass transit system; and enemy WMD tunnel complex. The first training in the upgraded facility will begin April 15.